Heat oven to 450°F. Unroll pie crust on work surface. Roll crust out slightly to 13 inches; cut into 8 (4-inch) rounds (reroll scraps, and cut out remaining rounds if necessary). Place rounds on ungreased cookie sheet. Use fork to poke holes all over dough rounds. Discard scraps. Bake 6 to 8 minutes or until tarts are golden and baked through. Cool completely on cooling rack. Meanwhile, in medium bowl, beat mascarpone cheese, 2 tablespoons of the sugar and the vanilla bean seeds with electric mixer on medium speed until combined. Spread 2 tablespoons mascarpone mixture on top of each fully cooled tart. Place jam in small bowl; stir until smooth. Spread about 2 teaspoons jam on top of each. Arrange strawberries in decorative pattern on top of each. Sprinkle with remaining 1 tablespoon sugar, then chopped pistachio nuts. Serve immediately. 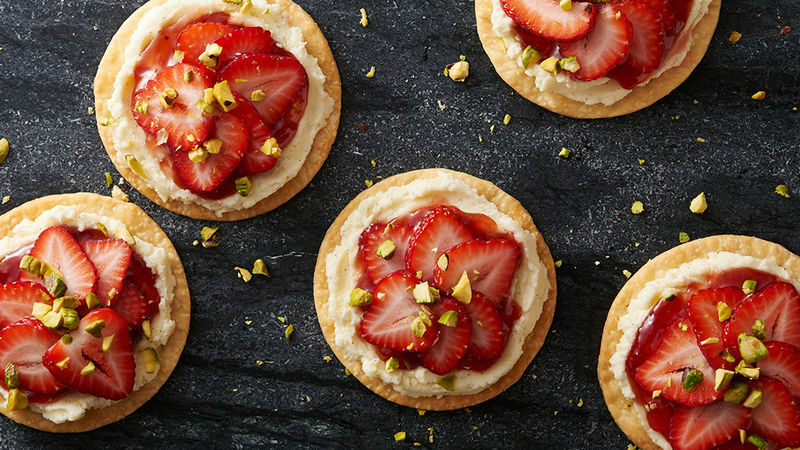 Swap mascarpone cheese for 1 package (8 oz) cream cheese, softened, if desired. Poking holes all over pie crust before baking keeps crust from puffing up too much in oven.